Souchal, Les Frères Coustou, Paris, 1980. Bresc-Bautier, “L’activité parisienne d’Hubert Le Sueur sculpteur du roi (connu de 1596 à 1658)” in Bulletin de la Société de l’histoire de l’art français, 1985, pp. 35-54. Avery, “Hubert Le Sueur, the ‘Unworthy Praxiteles’ of King Charles I”, in Studies in European Sculpture II,London, 1988, pp. 145-235. Chlibec, “Small Italian Renaissance Bronzes in the Collection of the National Gallery in Prague”, in Bulletin of the National Gallery in Prague, III-IV (1993-1994), pp. 36-52. Gallottini (ed. ), “Philippe Thomassin: Antiquarum Statuarum Urbis Romae Liber Primus (1610-1622)”, in Bollettino d’Arte, 1995, pp. 21-23. Castelluccio, “La Collection de bronzes du Grand Dauphin”, in Curiosité: Édutes d’histoire de l’art en l’honneur d’Antoine Schnapper, Paris, 1998, pp. 355-63. Baratte, G. Bresc-Bautier, et al., Les Bronzes de la Couronne, exh. cat., Paris, 1999. Kruse (ed. ), Hochrenaissance im Vatikan 1503-1534. Kunst und Kultur im Rom der Päpste, Berlin-Stuttgart, 1999, p. 332, cat.249. Bresc-Bautier, G. Scherf (eds. 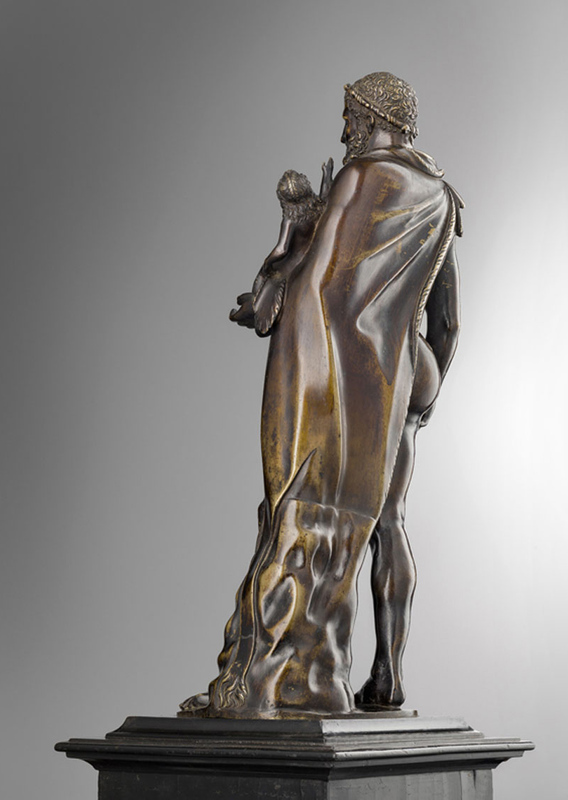 ), Bronzes français de la Renaissance au Siècle des lumières, exh. cat., Paris, 2008. Griswold, C. Hess, J. Bassett, et. al., “Casts after the antique by Hubert Le Sueur”, in D. Bourgarit, J. Bassett, G. Bresc-Bautier et. al. (eds. ),French Bronze Sculpture: Materials and Techniques 16th-18thCentury, Paris, 2012, pp.56-75. Wengraf (ed. 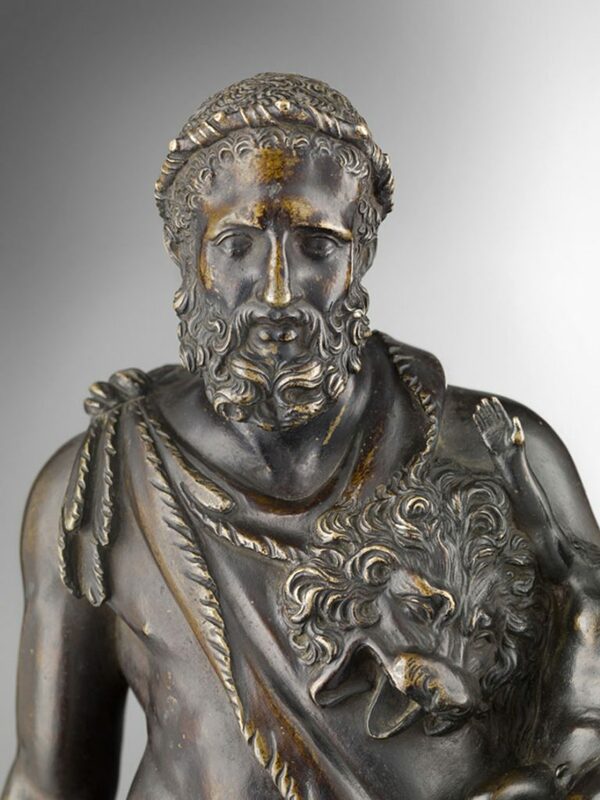 ), Renaissance & Baroque Bronzes from the Hill Collection, London, 2014, pp. 304-9. Most probably from the collection of Louis, Grand Dauphin de France (1661-1711), son of Louis XIV and grandfather of Louis XV, this newly discovered Hercules and Telephusis one of the most remarkable bronzes to have been created in early 17thcentury France, a stage in the history of sculpture that remains relatively undocumented. The only known faithful reduction of a Roman marble in the Vatican to have been made in France, it would have required careful, dal veroexamination of the original.The bronze stands out for the great attention to detail and understanding of the Greek hero’s anatomical proportions and psychological stance displayed in its modelling. The intensity of the hero’s portrayal, but also the careful after-work, moreover, position Hercules and Telephusalong a line of illustrious predecessors, rooted in the cultural phenomenon of the Italian Renaissance studioloand the production of sculptors such as Antico. 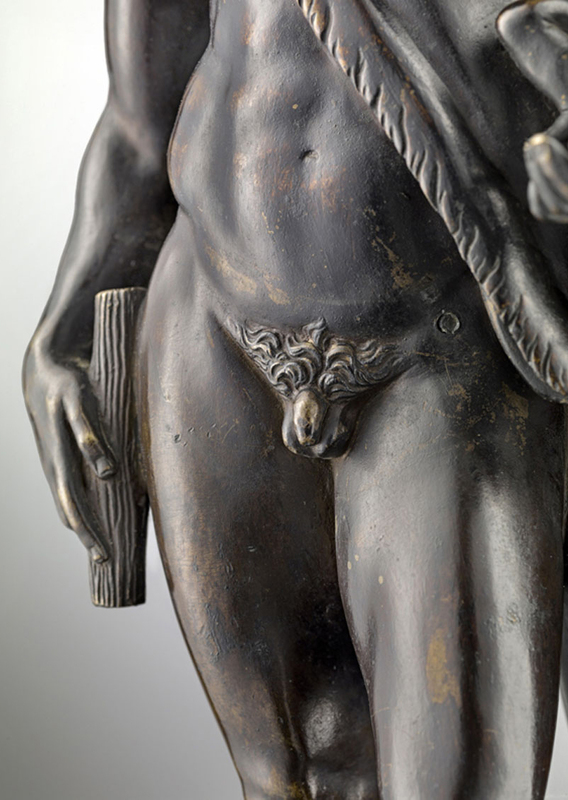 The heroic figure par excellence of classical mythology, Hercules would have resonated deeply within the political, cultural and artistic climate of early 17thcentury France as it had done nearly one hundred years earlier in the fragile but artistically vibrant courts of the Italian peninsula. To the artists gravitating around the Parisian elite, Rome was the chief source of inspiration, with virtually all painters and sculptors from Barthélemy Prieur to Michel Anguier spending months, sometimes years, studying and working in the Eternal City, where Nicolas Poussin and a circle of erudite collectors were refashioning the way of looking at antiquities, moving the arts towards a new classicism. Transported to the Vatican, it was soon installed in the Antiquario, the name given to the Belvedere Court designed by Bramante and achieved in 1514. Here were displayed the classical masterpieces in the Papal Collections, in accordance with and support of Pope Julius II’s project of a glorious Roman Renaissance. Hercules and Telephuswas therefore placed next to other iconic sculptures such as the Laocoön and his Sons, the Apolloand the Torso del Belvedere,whose impact upon the imagination of contemporary artists can hardly be overstated. Early restorations commissioned in 1533 by Pope Clement VI (1478-1534) to Giovanni Angelo Montorsoli (1507-1563) appear to have limited themselves to the reattaching of the hero’s broken toes. Only in the late 18thCentury will the forearm be restored with the addition of a plaster club.4 In 1536, Clement VII ordered Hercules and Telephusto be placed in its own niche within the Belvedere Courtyard, which had by then effectively become a “Pantheon of Heroes” for a renewed and more powerful Rome. For centuries, the iconography of the marble was not unequivocally identified. Hercules and Telephus was alternatively interpreted as representing Hercules holding his son Ajax, or as Emperor Commodus as Hercules. From a letter by Georgius de Negroponte to Sabba de Castiglione we know that at the time of the statue’s discovery, the child’s identity was unknown, but that Fedra Inghirami proposed to identify in the figure of Hercules that of the young Emperor Commodus – an idea shared by Francesco Albertini (1510) and Aldrovandi (1556).5Today, it is commonly accepted that the group represents Hercules and Telephus, son of the hero and Auge, the Arcadian princess and priestess of Athena who gave birth to the child within the sacred enclosure of the goddess. The Renaissance’s fascination with antiquity found in the Belvedere Court a centre of artistic pilgrimage, where artists and men of letters came to study. In 1513, Pope Leo X opened the Antiquario to a cultural elite which was then flocking to Rome from other Italian courts and foreign countries. Its sculptures became models to entire schools and their renown spread throughout Europe, thanks to drawings and to the diffusion of less costly engravings. The first reproduction of Hercules and Telephusis a pen and ink sketch by Maarten van Heemskerck (1498-1574) executed around 1523-37. 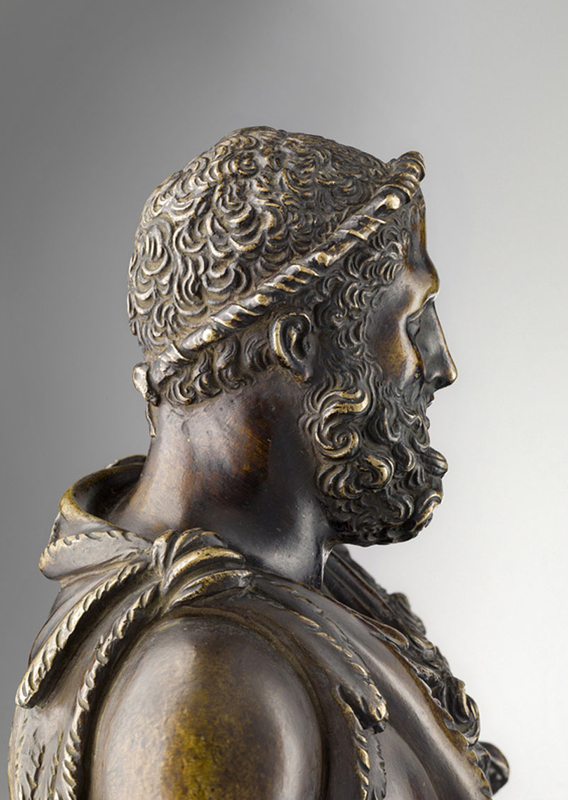 It is a detailed study of Hercules’s head from both side and front (fig. 2). Later sketches by Girolamo da Carpi (circa 1549-53, fig. 3) and Maarten de Vos and Goltzius portray the group following Montorsoli’s restoration. Ideals of beauty and power and exemplaof virtue were incarnated in Roman representations of gods and heroes. Just as the humanistic culture was recovering the classical texts of literature of philosophy, so artists looked at the representation of the human body and decorative repertoire to update their figurative language. A founding element of the Renaissance, this passion for ancient times saw the development of bronze copies, interpretations and reductions of classical sculptures. Art patrons from Italian courts wishing to have a memento of that perfection had to rely on contemporary artists, since the sculptures that were redefining the canon were typically incorporated into Papal or princely collections linked to the Holy See very early after their discovery. Moreover, early 16thcentury Papal bans on exporting ancient sculpture from Rome made it virtually impossible even for great aristocrats to build such collections. Bronze reductions thus came to satisfy and inform the novel courtly phenomenon of the studiolo, a room or study where the signorewould spend his free time and handle and examine his art collection at leisure, or show it to a selected circle of friends and visitors. But this was also the expression of a culture “tempted by a retreat to the inner world when faced with the troubles of history, [where] a gesture, a movement or even just the positioning of a naked body in the space, tended to express a philosophical or moral concept.”6The creation of such a microcosmosfurther encouraged the production of small bronzes, plaquettes, and marble reliefs to be displayed in cabinets. If the studioliof Federico da Montefeltro (1422-1482) in Urbino and Gubbio had been amongst the very first, others, more focused on painting and sculpture, came into being in the early Cinquecento, such as the camerino d’alabastroof Alfonso I d’Este, Duke of Ferrara (1476-1534), arguably the most magnificent art gallery of its time. Here, a rich array of small bronzes was displayed alongside the low reliefs in marble executed by Antonio Lombardo, whose language was directly inspired by classical themes. At around the same time, Isabella d’Este (1474-1539) wife of Francesco II Gonzaga, Marquess of Mantua, created her first studioloin the Castello di San Giorgio, commissioning paintings from the likes of Perugino, Mantegna and Lorenzo Costa. Isabella’s taste for sculpture resulted in commissions to some of the best artists of the time, including Tullio Lombardo and Gian Cristoforo Romano. 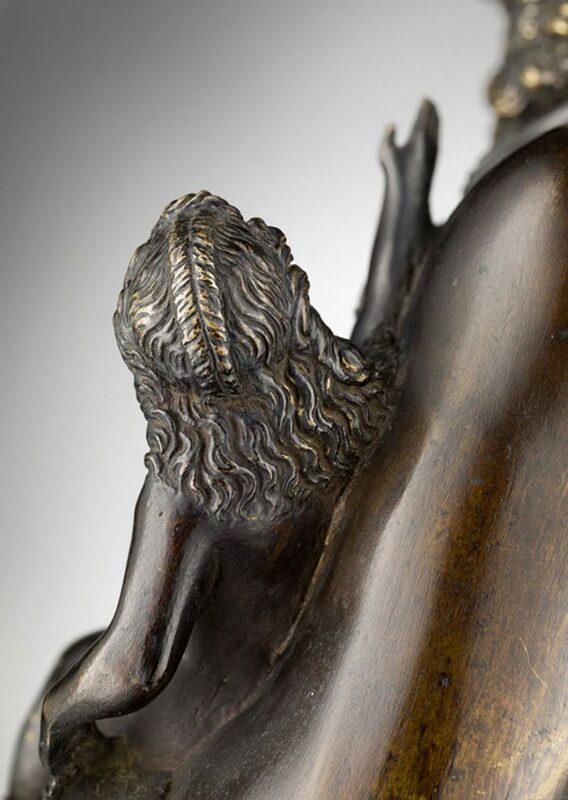 Importantly, her passion for bronzes occasioned her patronage of the most talented artist in this field, Pier Jacopo Alari Bonacolsi, called L’Antico (c. 1460-1528). 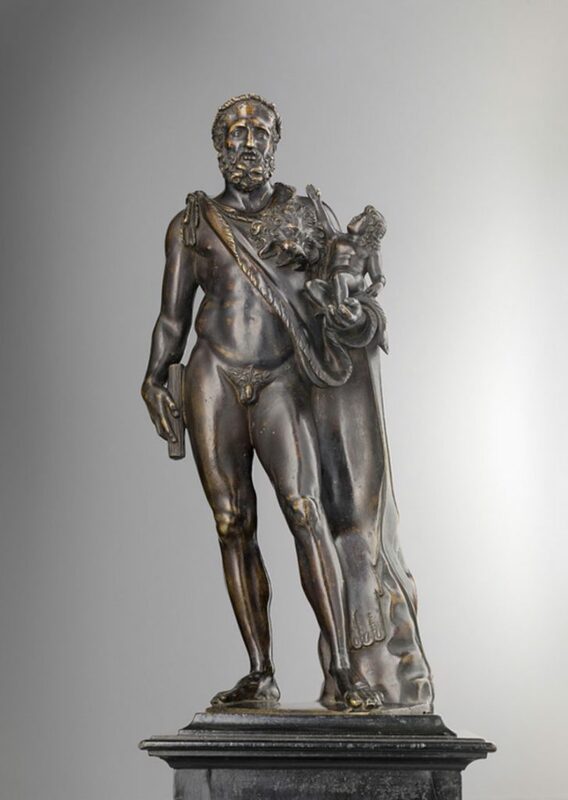 His unique interpretation of the antique resulted in a series of memorable bronzes which took the art of the Renaissance bronzettoon to an altogether different level (fig. 4). Under the reign of King François I of France, from 1515 to 1547, the royal court of Fontainebleau was able to contend with the most prestigious cultural centres of the Italian peninsula. 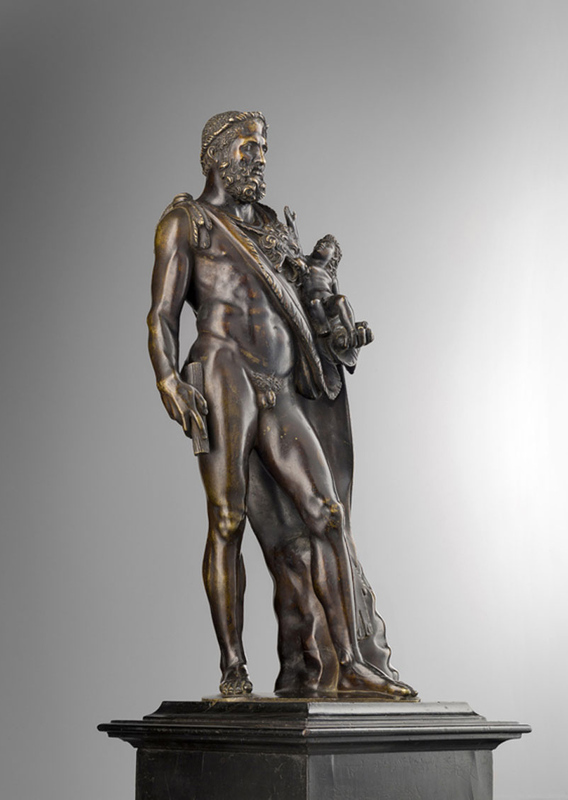 As part of a programme which whilst looking at the Italian Renaissance sought to exalt and consolidate the prestige of the French crown, the king commissioned Primaticcio (1504-1570) the first known life-size cast of the Hercules and Telephus marble, completed in 1543 (fig. 5), part of a series meant to rival the great statuary collections such as were to be admired in the Florence of the Medicis. Surprisingly, aside from the present bronze, only two other reductions of Hercules and Telephusare known to have been cast between the unearthing of the marble and the end of the 18thcentury. The first, by the Florentine Pietro da Barga (active between 1574-1588), is datable to circa 1574 and displays a typically rough, almost bozzetto-like surface andall’anticapatina (Bargello, Florence, fig. 6). The second, a much more faithful copy, is in the National Museum, Prague, catalogued as 16thcentury (fig. 7).8 It displays a less polished and detailed modelling, as well as noticeable differences, most notably in the pose of the young Telephus. Around 1683, Nicolas Coustou (1658-1733), then at the Académie de France in Rome, executed a terracotta of the Vatican sculpture (Musée du Louvre, Paris). Interpreting it as a Hercule Commode, Coustou dispenses with the figure of Telephus, placing instead in the hero’s left hand the Golden Apples of Hesperides, another of his attributes. The model was the starting point for the famous marble (Château de Versailles, fig. 8), of which numerous bronze reductions exist. The absence of the hero’s son makes these reductions impossible to mistake for the reproductions of the original marble group. Starting with the discovery of the marble, artists and connoisseurs alike imagined the rest of the missing forearm complete with its club.9For example, in 1543, long before the inclusion of the plaster club on the original at the end of the 18thCentury, Primaticcio has already imagined it. Interestingly, when translating the model from marble to bronze, Primaticcio was not in need of the tree stump supporting the antique version, and continued the lion skin to the ground. This indicates that our cast cannot be an adaptation of Primaticcio’s in Fontainebleau. It will however take several decades for another artist to undertake the creation of another life-size cast of Hercules and Telephus. This time, it will be realised by Hubert Le Sueur in 1631 and not for the French court, but for the English king: Charles I. 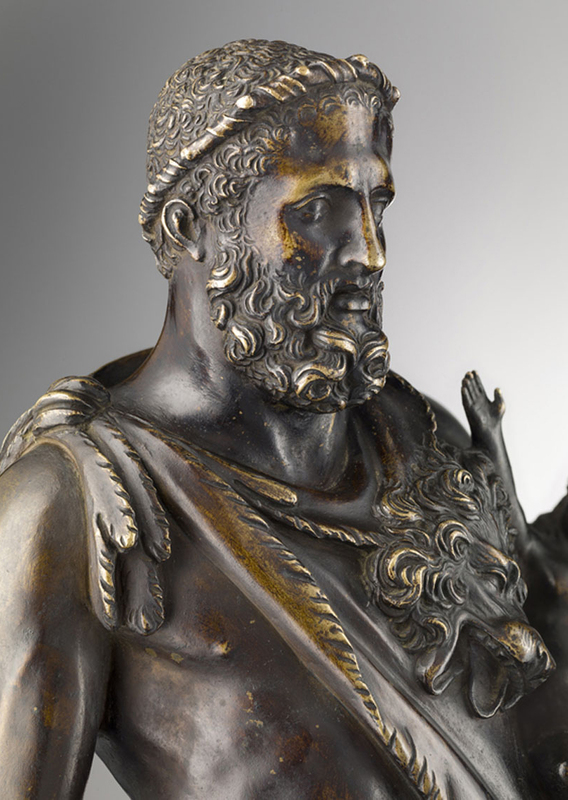 The understanding of the Greek hero’s stance and the great detailing displayed by the present bronze indicate that its author must have seen the original in Rome, possibly first sketching it in wax. 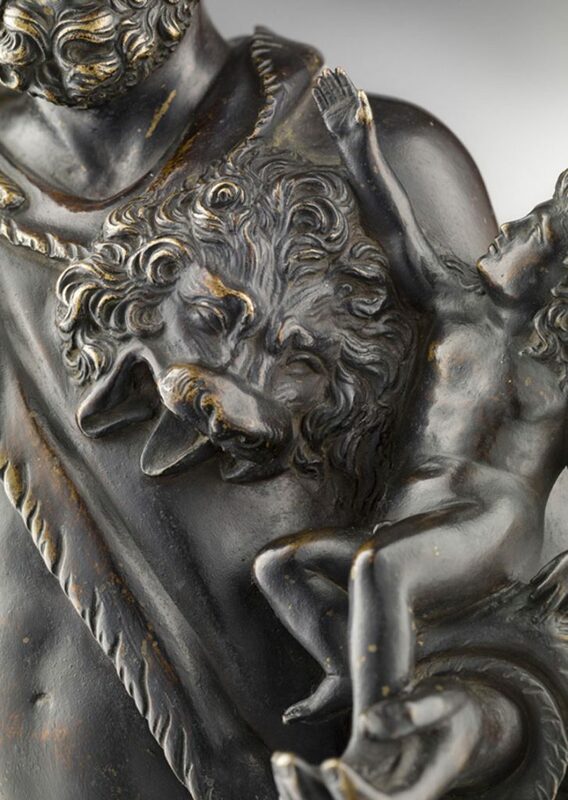 An attribution is therefore greatly complicated by the artist’s accurate mimesis, as well as by the copious lacunaestill extant in the study of early 17thcentury French bronzes, especially small ones. Recent exhibitions, however, have brought interest and scholarly knowledge on this subject to a new level. 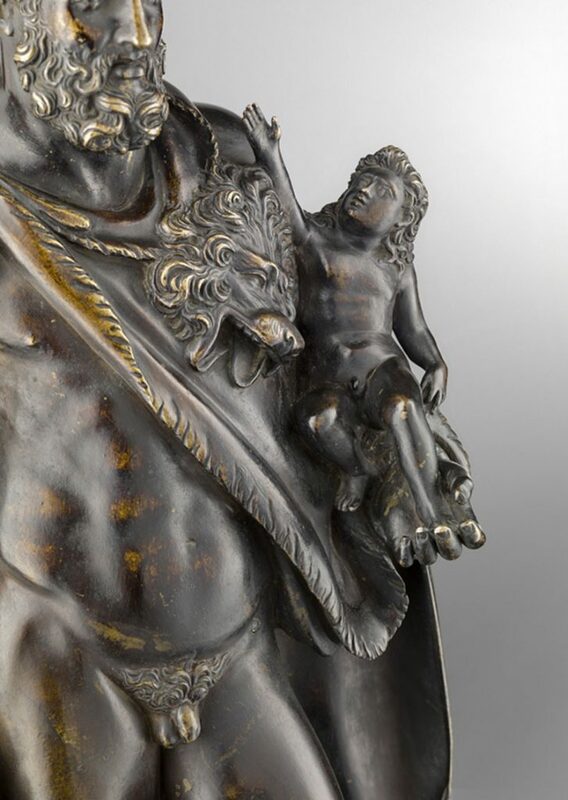 At first glance, Hercules and Telephusappears deeply informed by Italian 16thcentury sculpture – the achievements of Giambologna and Susini, certainly, but also those of Guglielmo della Porta in Rome even and the earlier production at Mantua and Padua. This should be read in the light of the fact that not only had Fontainebleau attracted a significant number of Italian artists, from Primaticcio to Cellini, but also that sojourns in Rome and other courts of Italy had, by the early 17thcentury, become an essential requirement for every self-respecting French artist. It is conceivable that a particularly attentive and receptive sculptor would have subsumed at least in part the spirit of the great Italian masters. Barthélemy Prieur (1536-1611) is probably the first French sculptor whose corpus is sufficient enough to allow for comparisons with the present bronze. In the early 1550s, he was in Rome with Ponce Jacquio. Information about his activity in the city is scarce, but he is noted as working as a stuccatoreand may have collaborated with Guglielmo della Porta.13From 1564 he is attested in Turin, working at the Court of Savoy. 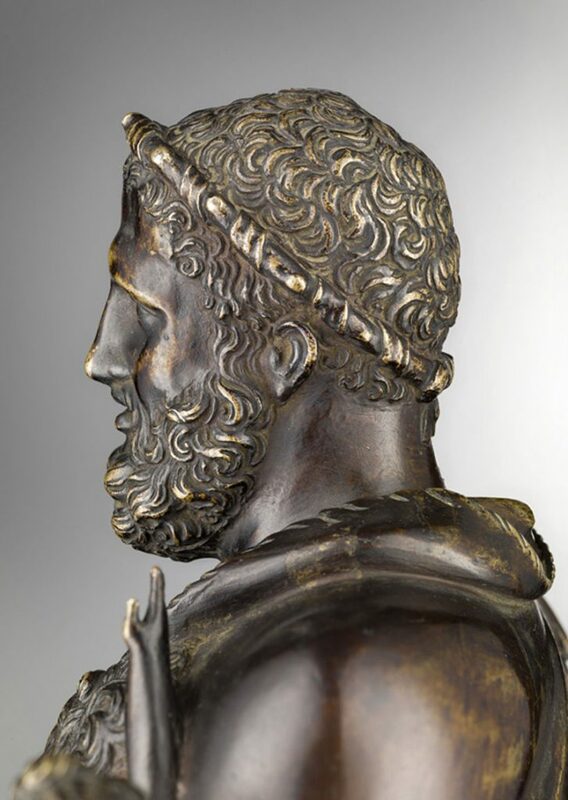 More than any other French sculptor before him, Prieur’s corpuscentres around small bronzes, often interpreting mythological subjects, and figures, or busts, of the French kings. The considerable confidence displayed by Prieur in the representation of the male figure is akin to that of the highly skilled author of the present Hercules and Telephus. His anatomical knowledge was such as to allow for variation and adaptation in the representation of the male body, as a simple comparison between his Neptune et trois chevaux marins(Melun, musée municipal), Mercury(New York, private collection), and Henry IV(Musée du Louvre, Paris, fig. 9) shows. Prieur adapts the musculature to the subject; thus, the first has the exaggerated torso that befits a marine god, the second is more ephebic, whilst the third one is more naturalistic (note the King’s chest). 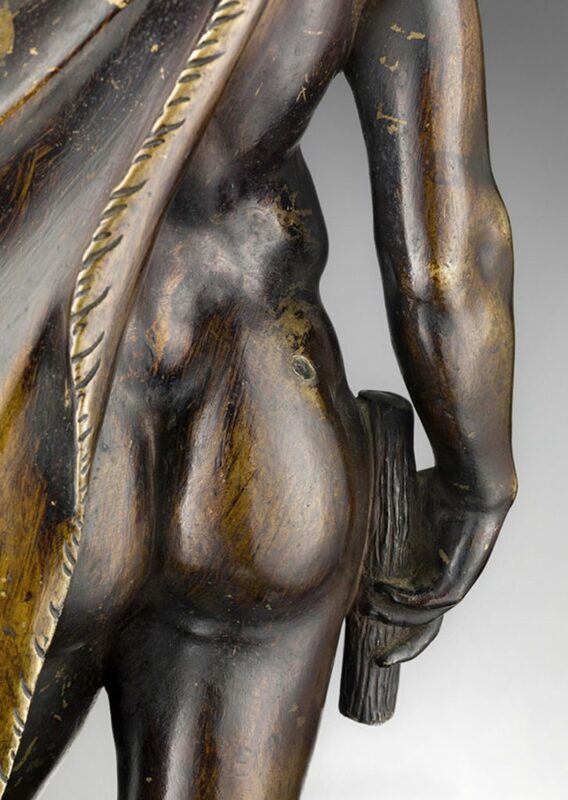 In the shadowy landscape of 17thcentury French bronzes, Michel Anguier (1612-1686) holds a luminous position. Like many of his predecessors, he left for Rome in 1641, where he lived a decade, joining a circle of artists which included Nicolas Poussin and François Duquesnoy. There he became the assistant of Bernini, an influence clearly discernible in some of his best-known bronzes such as the Neptune agité(private collection). Anguier came back to Paris in 1651, taking with him some models of antiquities such as the Farnese Herculesand the Laocoön, neighbours of the Hercules and Telephusmarble. He famously produced a series of seven bronzes representing gods and goddesses: Neptune, Amphitrite, Pluton, Ceres, Mea, Jupiterand Junon, inventions which, informed by the antique studied during his Roman years, are akin to a manifesto which, as noted by Wardropper,14 expresses the teoria degli affetti, or theory of passions, as was being discussed in the Roman intellectual circles of Poussin and Domenichino. 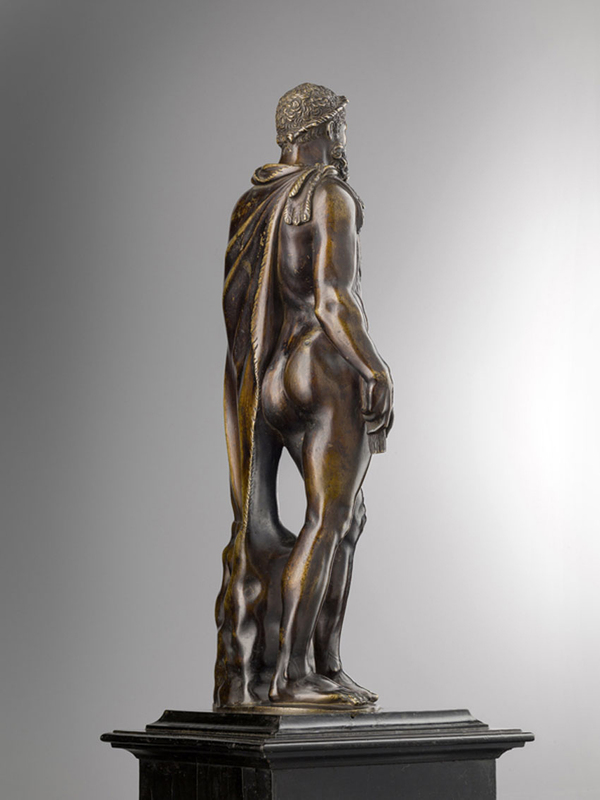 The intense emotions that Anguier’s bronzes betray are a direct result of his highly-developed intellectual programme. Although reductions of a known classical marble is undocumented in Anguier’s oeuvre, he would not have lacked the opportunity, and would certainly have had ample chance of admiring the original marble in the Vatican during his extensive Roman sojourn. If a “reduction” seems far from Anguier’s programmatic intentions, the project might have been an early one. Comparisons on pure stylistic grounds reveal striking similarities with the present Hercules and Telephus. In general terms, the attention to proportions and anatomic details from the overall musculature to particulars such as the hands, ankles and feet, but also the cut of the eyes and chasing of the hair, is similar to that seen on our sculpture. A case in point is the Pluton mélancolique(fig. 10). Not only are the feet nearly identical; their positioning, and in fact that of most of the body – the right arm and hip, and both legs – is virtually the same. Moreover, details such as the protruding forehead structure, the cut of the eyes including the eyelids, and the chasing of the hair, is very similar to that of the Jupiter foudroyantin the J. Paul Getty Museum, Los Angeles (fig. 11). However, direct copies after the antique by Anguier are unknown, and similarities such as those of Pluton’s can be explained with his fluency in the classical modes of representation which the artist adapted to his philosophical intentions. 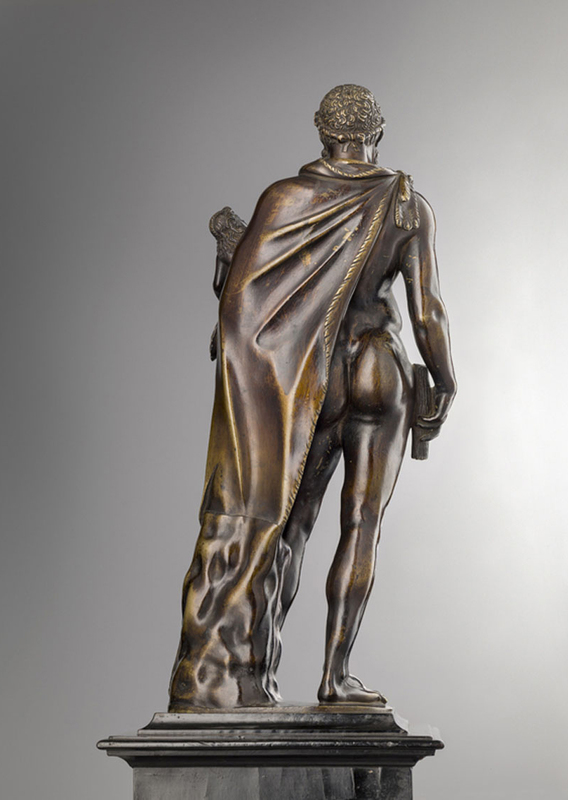 Whilst Prieur and Anguier’s bronzes show certain stylistic traits in common with Hercules and Telephus, it is to Hubert Le Sueur (c. 1580 – 1660) – a veritable link between the two other artists – that the bronze may most confidently be attributed, on the grounds of technique and cultural framework. Back in Paris from 1640-41, at the start of the English civil war, Le Sueur appears to have mainly worked old ideas, as testified by the commission, in 1647, of four life-size Dianas(one lost) and two more Commodus, or Hercules and Telephus, of which one survives.19The sculptures were destined to the gardens the maréchalNicolas de Neuville, marquess of Villeroy at the service of the young Louis XIV, and Louis Phélypeaux. Importantly, these later versions are further detached from the Roman originals. 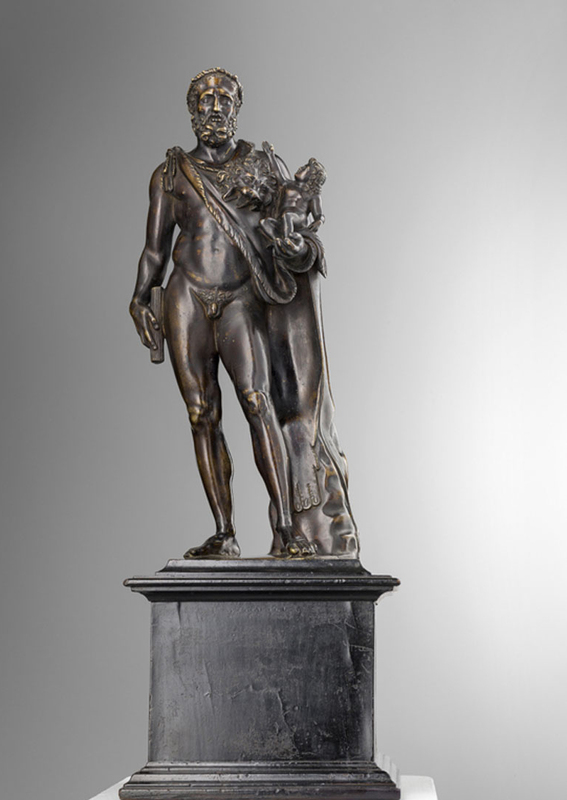 The present bronze is undoubtedly closer to the Hercules and Telephus he made for Charles I, now at Windsor Castle (fig. 12), rather than the more experimental versions realised in or after 1648, of which the extant one is now in the Huntington Art Gallery, San Marino (fig. 13). In the latter sculpture, for example, there is no tree stump, and the knot of the Lion’s skin on the right shoulder is remarkably different. 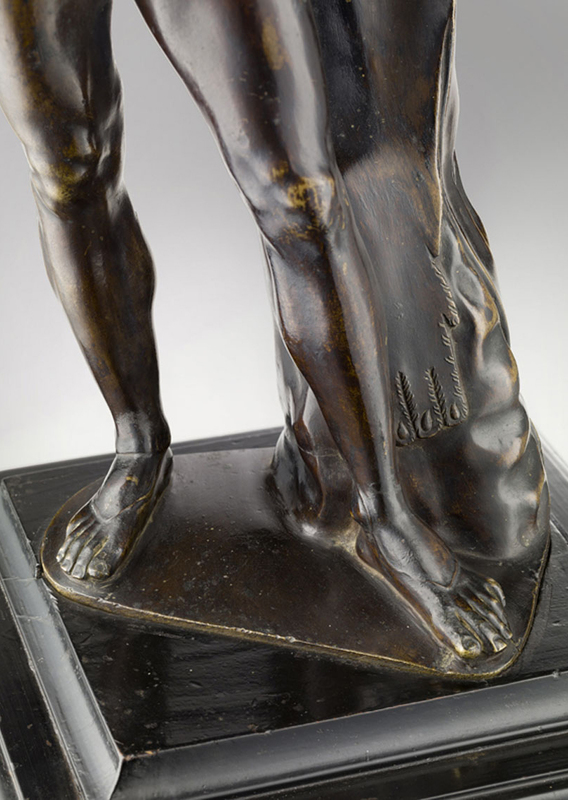 Interestingly, a detail differing from both large-scale sculptures is the hand of Telephus, which, on our bronze, is not resting on the lion’s head but rather directed towards Hercules himself. This is an important detail since the incomplete right hand of the child on the marble does not rest on the lion but is rather extended towards the child’s father, as seen on our reduction, a further proof that our artist was looking at the antique first-hand. 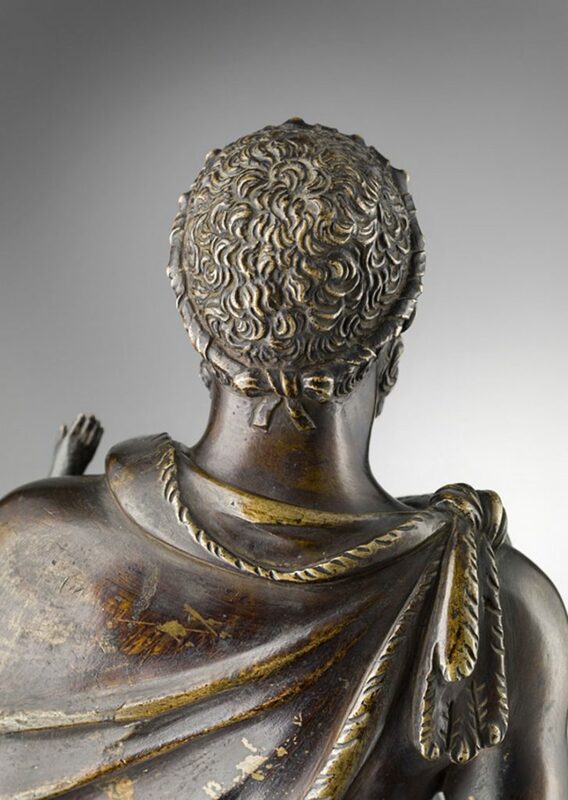 The quality of Le Sueur’s bronzes varies, and although we only rarely see in his oeuvre an after-work of comparable finesse and painstaking accuracy, this is by no means an isolated case. Compare, for instance, the relatively bland surface of his Fountain of Diana(c. 1636, Bushy Park, Somerset), with the figure of Charityfrom the Richmond Tomb (c. 1628, Westminster Cathedral, London), in particular the fine treatment of the hair. While working on life-size casts for Charles I, Le Sueur may have wishes to wait until his return to Paris for casting the present reduction, an occurrence which would have taken place in the 1630s. It would have been a very practical exercise for Le Sueur to show the French court his realisations in England and to reassert himself within the French artistic milieu. But it is also impossible to exclude a 1640s casting, following his definitive homecoming which saw him working, once more, on the same subject. Nonetheless, this later date in the first half of the 27thcentury seems more unlikely. Imposing and retaining all the authoritativeness of the original marble, Hercules and Telephuswould have been conceived for a very important patron of means, whose identity may only be unveiled by future discoveries. From the latter part of the 17thcentury, the bronze has nonetheless been traced in the inventories or three eminent personages in the history of France – all three, in their different ways, distinguished collectors of great importance: François Le Vau (1613-1676), Louis, Grand Dauphin de France (1661 – 1711), and Jean-Baptiste, Comte du Barry (1723-1794), tying this work of art with over a century of French history, and shedding new light to the modes of collecting and taste of their time. Almost certainly sold on the open market soon after Le Vau’s death together with his other possessions, Hercules and Telephusis next recorded, two decades later, in the legendary collection of the Grand Dauphin, whose eclecticism extended from the patronage of the ébénisteCharles-André Boulle to the collecting of precious stones, painting, and sculpture. After his death in April 1711, Louis XIV took back the nine bronzes gifted in 1681, whilst the Grand Dauphin’s three children retained some jewels and pieces of furniture as well as a few more bronzes, which thereafter entered the Royal collection,28and amongst which the Hercule tenant un petit enfantdoes not figure. To cover the huge debts accumulated by the Prince, his heirs dispersed the rest of the collection at Marly, “avec une indécence qui n’a peut-être point d’exemple” (Saint-Simon). It is logical to believe that valuable works of art would have had to be included in the sale in order to meet the creditors’ expectations. The pace of the French art market in the 18thcentury was a quick one. Paintings, sculptures and works of art were regularly sold at the death of a collectionneur, or sometimes during their lifetime, to pay off debts. Thus, some sixty years after the death of the Grand Dauphin, the Hercule and Telephusreappears in the collection of a nobleman whose relationship with the French crown was a very close one indeed. Known for his dissolute life as Le Roué, Count Jean-Baptiste du Barry was born at Lévignac, in Haute-Garonne, in 1723. His fortunes rose upon his arranging the marriage of his former lover, Jeanne Bécu, with his younger brother Guillaume du Barry in 1768. By giving her a title, Jean-Batiste and Guillaume legitimised her position as the mistress of King Louis XV, and benefited from the latter’s lifelong gratitude. Following the King’s demise and Madame du Barry’s banishment from the court in 1774, Jean-Baptiste acquired estates near Toulouse and an hôtel particulier in the centre of the town, rebuilt ex-novo in a lavish Neoclassical style. In 1776, in order to finance the building campaign, the contents of his Rue de Richelieu apartment – then inhabited by his son, the Vicomte Alphonse du Barry, are sold at auction. Significant works dispersed between the 11 March and 21 November 1774 sales included Rembrandt’s Simeon in the Temple(1627-28, now Hamburger Kunsthalle), Joseph-Marie Vien’s Sweet Melancholy(Cleveland Museum of Art), and Jean-Honoré Fragonard’s Annette at the Age of Twenty(Galleria Nazionale d’Arte Antica, Rome) to name but a few. Importantly for establishing the provenance of the present sculpture, one copy of the du Barry’s sale catalogue (Petit Palais, Paris) was illustrated by one of the most original personalities of 18thCentury France, Gabriel de Saint-Aubin (1724-1780). Lot 142 included “Hercule tenant sur son bras gauche un enfant. […] 15 pouces de haut”. Only last year, the bronze resurfaced in the collection of a noble family near Aix-en-Provence in the south of France, where it had been sitting for generations, thus allowing us to appreciate the remarkable quality the French bronze production had already achieved in the early 17thcentury, with nothing to envy to the output of the best workshops active for the Italian courts. 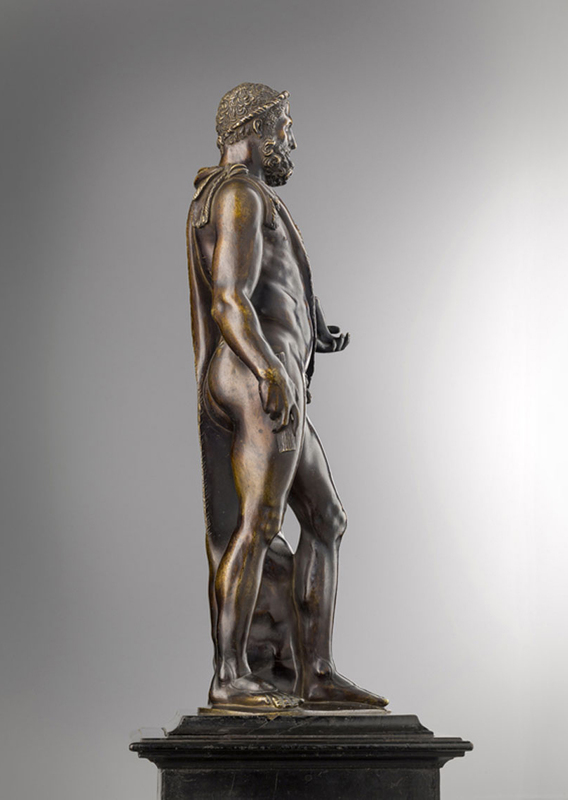 Hercules and Telephusthus gives us an extraordinary opportunity to better understand the influences that played such a great role on sculptors of the time, and the rare methods they developed for casting in bronze. 1For example, upon his death Charles Errard, first director of the Académie de France in Rome, gifted his collection of seventy-one bronzes to Louis XIV. Cf. S. Castelluccio, op. cit., p. 355 and note 5. 2 Cf. F. Haskell, N. Penny, Pour l’Amour de l’Antique: La Statuaire Gréco-Romaine et le Goût Européen 1500-1900, Paris, 1999, pp. 209-11. 4These restorations, including the iron clamps, will only be removed during the 1980s intervention on the marble. 5 Cf., respectively, A. Luzio, “Lettere inedite di Fra’ Sabba da Castiglione”, in Archivio Storico Lombardo, III, Milan, 1886, pp. 91-112; F. Albertini, Opusculum de mirabilibus Urbis Romae, Rome, 1510; L. Mauro, Le antichità della città di Roma, 1556. The identity of the child will remain doubtful until much later. 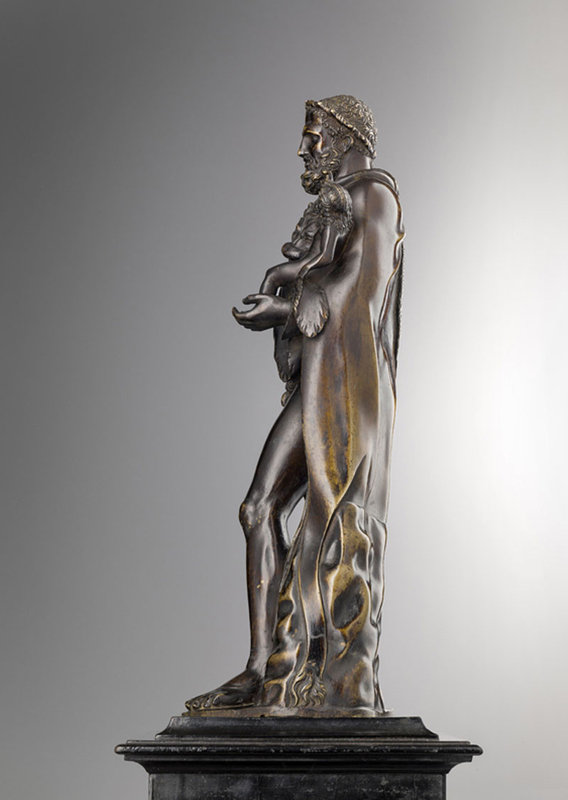 It will be seen that, unlike reductions of the immediately identifiable Silenus holding the young Bacchus in his arms, the present bronze will generally be described in inventories and sales catalogues as Hercules holding an infant. Cf. below, notes 24 and 26. 6M. Ceriana, Il Camerino di alabastro: Antonio Lombardo e la scultura antica, exh. cat., Milan, 2004, p. 13. 7 Cf. S. Pressouyre, “Les fontes de Primatice à Fontainebleau”, in Bulletin Monumental, 127, 3 (1969), p. 227. After the French Revolution, the sculpture was transferred to the Louvre. It is now back at Fontainebleau, in the Galerie des Cerfs. See also G. Bresc-Bautier, “L’art du bronze en France 1500-1660”, in Bronzes français…, op. cit., pp. 58-60. 8 Cf. Hochrenaissance…,op. cit., p. 522, cat. 249; J. Chlibec, op. cit., pp. 36-52. 9Cf. 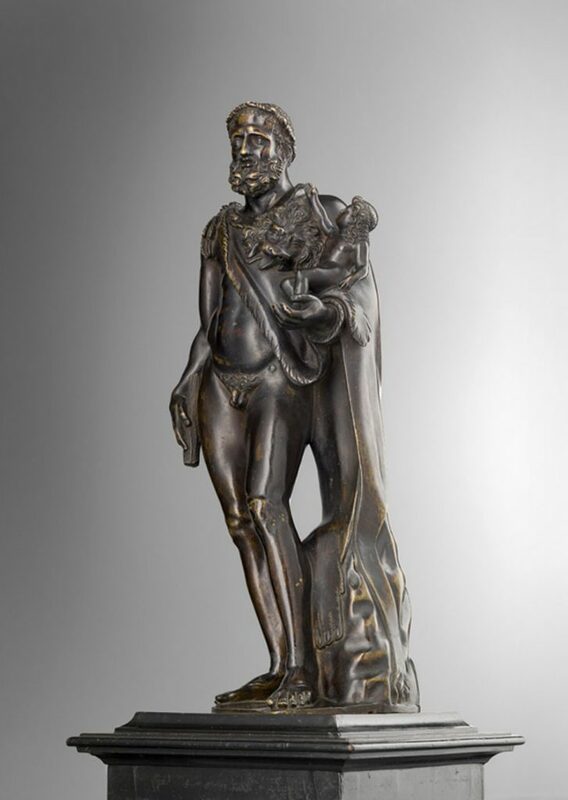 P. Liverani, A. Nesselrath, “Statue of Hercules and the Infant Telephus”, in M. Koshikawa, M. J. McClintock, High Renaissance in the Vatican: The Age of Julius II and Leo X, exh. cat., Tokyo, 1994, pp. 69-70. 10Cf. J. Bassett, F. G. Bewer, “The Cut-Back Core Process in Late 17th– and 18th-century French Bronzes”, in D. Bourgarit, G. Bresc-Bautier et al. (eds. ), French Bronze Sculpture,2014, pp. 205-14. 11 The analysis was carried out in 2018 by Dr Arie Pappot, Junior Conservator of Metals, at the laboratories of the Rijksmuseum Amsterdam. 12Thermoluminescence test of the core material was carried out in 2018 under the supervision of Art Analysis & Research Inc., London, New York, and Vienna. 13It is interesting at this stage to note the existence of a small bronze bust of Hercules’s head from the Hercules and Telephusmarble group in the Kuntshistorisches Museum, Vienna. Catalogued as probably Roman, mid-16thcentury, it may be reconduced to the circle of Guglielmo della Porta and workshop. Cf. Hochrenaissance…,op. cit., cat. 250. 14Cf. Bronzes français…, op. cit., p. 205. 15G. Bresc-Bautier, op. cit., 1985, p. 36. 17Ibidem, p. 40, note 22. 18Cf. “Casts after the antique…”, op. cit., p. 63, note 27. 19G. Bresc-Bautier, op. cit.,1985, p. 44. 20Quoted in C. Avery, op. cit., p. 149. 21In a private collection. Cf. Avery, op. cit., p. 190, cat. 34. Note also the knot on a bronze bust of Henry IV formerly in the collection of the Duke of Buccleuch, illustrated in ibidem, p. 152, cat. 48, and the equestrian bronze of Charles I, c. 1632 (Ickw orth, Suffolk) illustrated in ibidem, p. 171, cat. 15. 23The medallions are casts from two of the twelve Labours of Hercules sculpted by Flemish sculptor Gerard van Opstal (1594-1668) for the Galerie d’Hercule of the Hôtel Lambert de Thorigny, built by Louis Le Vau (cf. Bulletin de la Société de l’histoire de l’art français, 1998, p. 161; Blanche Penaud-Lambert, “La galerie de l’hôtel Lambert: la part du peintre et celle de l’architecte”, in Bulletin Monumental, 166-1 (2008), pp. 53-62. 25Cf. S. Castelluccio, op. cit., p. 355 and note 3. 26The move of each single item to the various castles would be annotated on the inventory (see below, note 26). 27Agates, cristaux, porcelaines, bronzes et autres curiosités qui sont dans le cabinet de Monseigneur le Dauphin à Versailles. Inventoriés en MDCLXXXIX, Bibliothèque d’art et d’archéologie, Fondation Jacques Doucet, 231 p. (MS 1046; original in private collection). 28 It is worth mentioning that the procedure of marking the bronzes of the French royal collection was first introduced by Moïse Augustin Fontanieu, who became the head of the Garde-Meuble on October 11, 1711. Cf. Les Bronzes de la Couronne, op. cit., p. 15 and note 16.